This research study involved the use of extensive secondary sources such as press releases, investment reports, industry white papers, presentations, the Pump Distributors Association, British Pump Manufacturers Association, Association of Equipment Manufacturers, journals, database, and other publicly available sources to identify and collect information useful for a technical, market-oriented, and commercial study of the global pumps market in oil & gas industry. The primary sources include several industry experts from the core and related industries, preferred suppliers, manufacturers, distributors, service providers, technology developers, standards and certification organizations from companies, and organizations related to all the segments of this industry’s value chain. The research methodology has been explained below. After arriving at the overall market size, the pumps market in oil & gas industry was split into several segments and subsegments. The figure given below illustrates the breakdown of primary interviews conducted during the research study on the basis of company type, designation, and region. The leading players in oil & gas pumps market are Flowserve (US), Sulzer (Switzerland), KSB (Germany), Weir Group (UK), and Grundfos (Denmark). The global oil & gas pumps market is projected to reach a market size of USD 10.36 billion by 2023, at a CAGR of 4.12% from an estimated USD 8.47 billion in 2018. This growth can be attributed to the increasing unconventional resources in the North American, South American, and Asia Pacific regions and development of gas terminals. 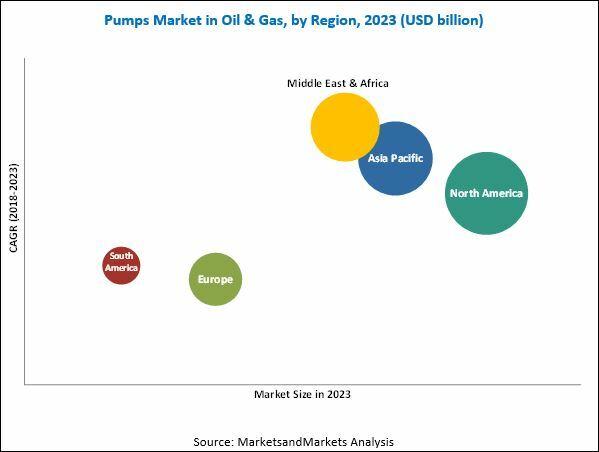 The pumps market in oil & gas industry, by type, is segmented into centrifugal, positive displacement, and cryogenic pumps. The centrifugal pumps segment is expected to hold the largest market share by 2023 as these pumps are preferred for processes that handle low viscosity liquids and high flow rates. Various types of centrifugal pumps are used in a wide variety of applications; for example, electrical submersible pumps are used as a water and oil separator, in which water can be reinjected into a reservoir without lifting it to the ground surface. The ability of these pumps to be used across various applications has resulted in their higher market share. The report segments the pumps market in oil & gas industry, by application, into upstream, midstream, and downstream. The midstream segment is expected to dominate the oil & gas pumps market by 2023 owing to the growth of unconventional resources, which is creating the need for an expanded midstream network of pipelines, rail, tankers, and terminals. In this report, the oil & gas pumps market has been analyzed with respect to 5 regions, namely, North America, Europe, Asia Pacific, Middle East & Africa, and South America. North America is estimated to be the largest oil & gas pumps market from 2018 to 2023. 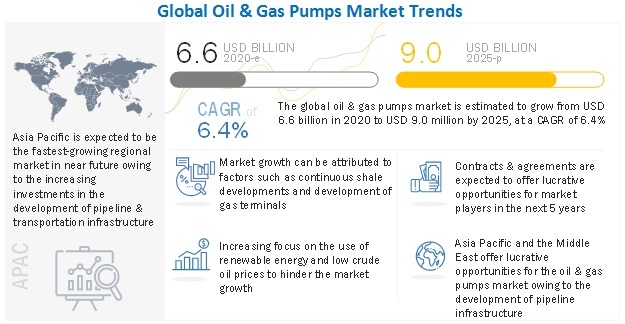 The pumps market in the oil & gas industry in North America would be mainly driven by the growth in unconventional resources in the US and Canada. The demand from the onshore & offshore fields in the Gulf of Mexico is also likely to impact the pumps market positively during the forecast period. Fluctuating crude oil prices along with growth in renewable energy could act as a restraint for the pumps market in oil & gas industry. Growth in renewable energy is expected to be one of the biggest restraining factors for the pumps market as it reduces the cost of power generation and rising concerns on carbon emission. These factors are expected to reduce the dependency of countries on fossil fuels and are acting as restraints to the pumps market. Further, the fluctuations in crude oil prices have reduced the upstream operator’s capex spending for new fields as crude oil prices have been seen to witness a constant fluctuation over the past 4 years. Therefore, if it becomes less lucrative for oil & gas companies, the operators may suspend their capacity expansion plans. This is likely to affect the demand for new pumps in the oil & gas industry. The leading players in oil & gas pumps market are Flowserve (US), Sulzer (Switzerland), KSB (Germany), Weir Group (UK), and Grundfos (Denmark). Contracts & agreements was the most commonly adopted strategy by the top players. This was followed by new product developments and investments & expansions. *Details on Business Overview, Products Offered, Recent Developments Might Not Be Captured in Case of Unlisted Companies.